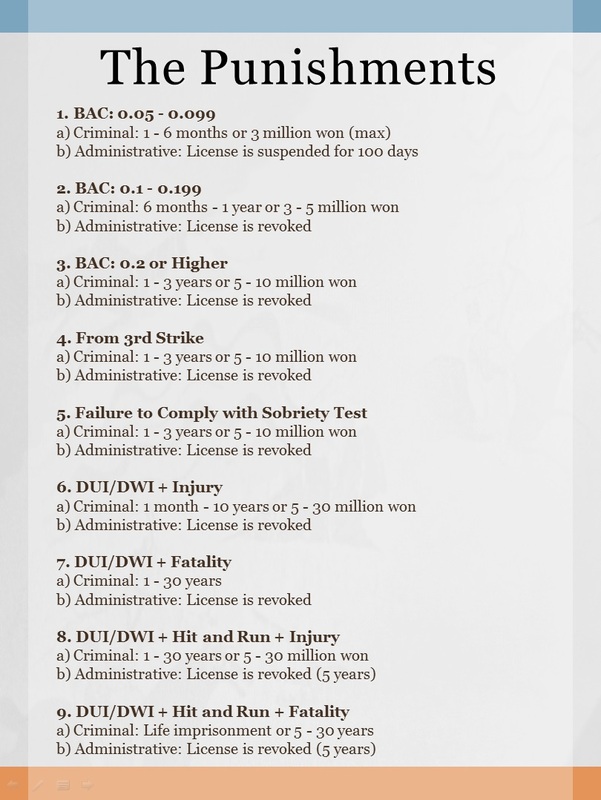 In Korea, the legal threshold for “drunk driving” is a BAC of 0.05 or above. This is normally attained after 2-3 shots of soju or 2-3 bottles of beer. For fun, below are 10 “true or false” questions. Why not give them a try? I use the terms “DUI/DWI” and “drunk driving” synonymously. Answer key at the bottom of this post. 1. “Drunk driving” is a crime. 2. If you were sitting in the driver’s seat and the vehicle was turned on, you can be punished for “drunk driving” even if the vehicle did not move an inch. 3. You can be punished for “drunk driving” even while parking at the basement parking lot (of your apartment complex). 4. Even 49cc (moped) scooters are subject to the same “drunk driving” laws. But, bicycles are not. 6. “Failure to Comply with Sobriety Test” is a crime; therefore, you can be arrested on the spot. 8. A driver can ask for a “blood test” before or right after undergoing the breathalyzer test. 10. Your DUI/DWI can be expunged from your criminal record. 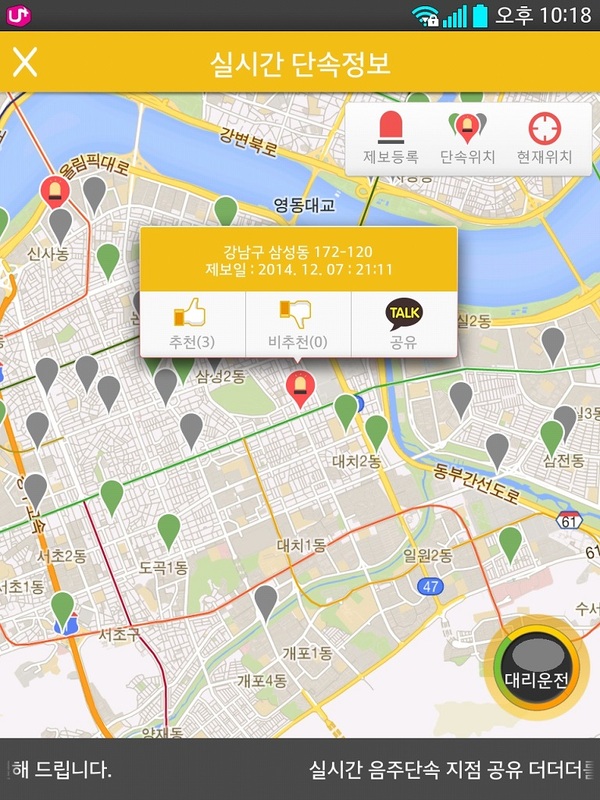 Above is a screenshot of a well-known “DUI checkpoint app” here in Korea. A “DUI checkpoint app” is a mobile app which allows users to tip one another off (real-time) about police checkpoint for “drunk driving.” I tried downloading one for the first time. This one is called “더더더” (which translates to “More, More, More.”) The app is called “More, More, More” because that is normally what police officers tell a driver who is blowing into a breathalyzer. Currently, there are more than 10 such apps, and there is no law to ban them. The police are having a hard time. Sometimes, recent use of (alcohol-based) mouthwash can affect the results of a breathalyzer test. In Korea, the above are said to be the most likely. If you use mouthwash frequently, you should mention this to the officer and ask for an opportunity to gargle your mouth with water (first). You could even ask for a blood test. Blood test results normally prevail over breathalyzer results, but they could take up to 10 days to come out. 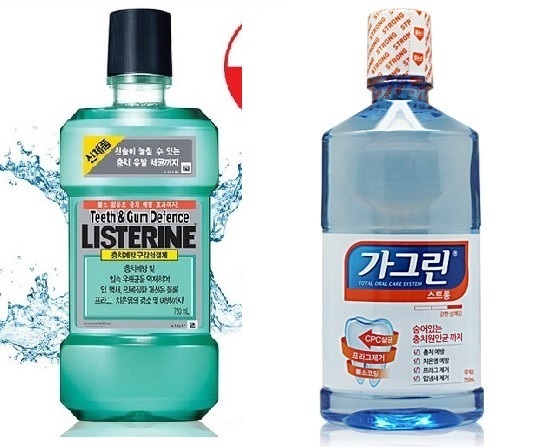 Gargling (입헹굼) Issue: If you expressly asked for an opportunity to gargle but were denied, that could be illegal. In contrast, failure (by an officer) to voluntarily offer or inform of such an opportunity is unlikely to be illegal. I read of a lower court case saying that the absence of an opportunity to gargle does not, in itself, negate a breathalyzer test result. (1) An act which is performed in order to avoid impending danger against the one’s own or another person’s legal interest shall not be punishable when there are reasonable grounds. (2) The provisions of the preceding paragraph shall not apply to a person charged with duties not to avoid the danger. (3) The provisions of paragraphs (2) and (3) of the preceding Article shall apply mutatis mutandis to this Article. Recently, comedian Noh Hong-chul was charged with “drunk driving.” Yes, he was the “elevator guy” in Psy’s “Gangnam Style” music video. Noh has since withdrawn from all shows including Infinite Challenge. It was reported that he was caught while trying to move his illegally parked car to another area. Last year, comedian Yoo Se-yoon was fined for “drunk driving.” It became news at the time because Yoo turned himself in. And, it wasn’t like there was an outstanding warrant for his arrest. The police were probably like: “So you did what now?” This was unheard of. Yoo recently appeared on JTBC saying (he thinks) his (criminal) fine was reduced from 3 million to 2 million won (for that). In Korea, there are “replacement driver services” (대리운전) available. You can call and have someone drive you and your car home (for 10-30 bucks). But, make sure the company has insurance. It’s a good idea to use one, reliable company repeatedly. Try not to use drivers who solicit on the spot. In case of an accident (caused by a replacement driver), the (insured) company is responsible for all property damage as well as injuries to the passengers of the vehicle that was being driven. But, the owner of the vehicle (i.e., his/her insurance) is still responsible for injuries to 3rd parties. If you use such services often, you could opt for the so-called “대리운전 위험담보 특약” found in most auto insurance plans. For an extra KRW 20,000 – 30,000 (each year), your insurance will also cover all replacement driver-related accidents. Regardless of whether the replacement driver (company) has insurance. Remind your replacement driver to drive safely and make sure he/she parks your car completely. If you try to re-park, that could constitute “drunk driving.” Also, remember that you could still be drunk the next morning. Try to use public transportation. Legal Tidbit: In Korean law, “대리” or “대리권” normally means “agency” (as in principal/agent). 1. True. “Drunk driving” is a crime, and it will be entered into the offender’s criminal record. 2. False. The motor vehicle has to actually move (at least) some distance. 4. True. “Drunk cycling” is prohibited, but there is currently no law which outlines punishment for such behavior. 6. True. In such case, no warrant is necessary. When being arrested, the Miranda Warning must be given or all subsequent test results will be inadmissible in court. 7. True. A driver who is clearly too drunk to even realize what is going on cannot be punished for this crime. 8. True. Before or right after. FYI, right after a “positive” breathalyzer test result, the driver must be notified of such right. The request for a blood test must be made w/i 30 minutes from the breathalyzer test. Also, if the blood sample is taken more than 30 minutes after making such a request, the blood test result will be relegated to the status of “corroborating evidence.” That is why one should head over to the nearest hospital (w/ the police) quickly. 9. True. For a friend, yes. (FYI, for a “relative” or “family member,” no.) See Article 151 of the Criminal Act. 10. False. 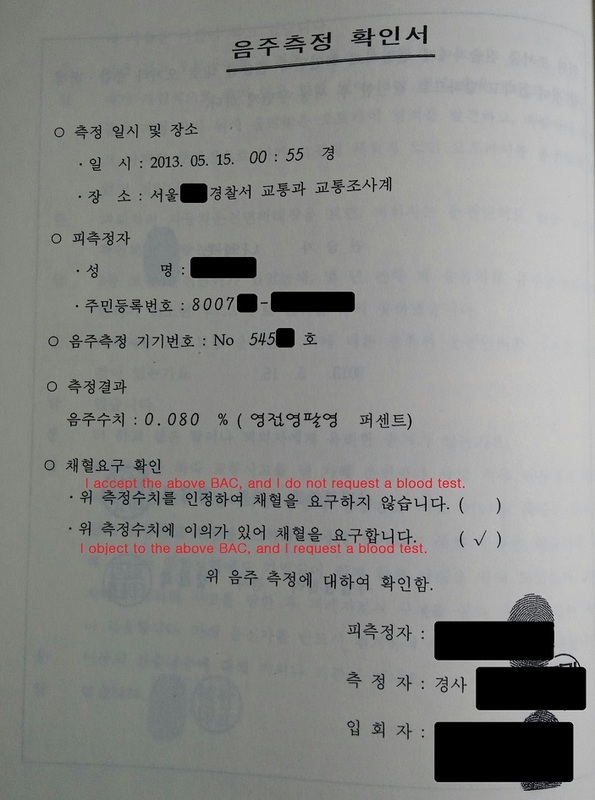 You can only have your criminal fine (벌금) “not appear” if 2 years have elapsed since payment. A summary of the punishments for “drunk driving” and related offenses. FYI, “Failure to Comply with Sobriety Test” is separate crime from “drunk driving.” Why drink and drive anyway? 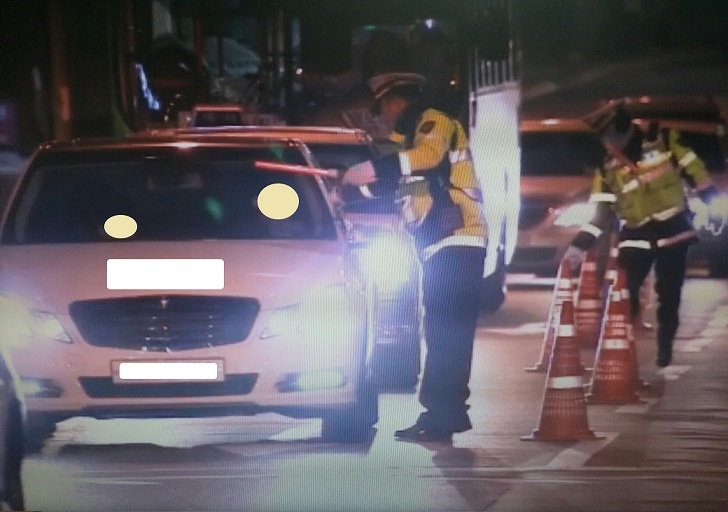 Every year, Korean law enforcement likes to crack down on “drunk driving” in December and January (i.e., right now). According to the news report above, DUI checkpoints are normally set up between the hours of 10 p.m. and 6 a.m.
One final thing I want to mention is that you should never get on a vehicle driven by a drunk driver. In a worst-case scenario, the passenger can face criminal punishment (for “aiding and abetting”) if the drunk driver ends up killing someone. Also, if the passenger knew the driver was drunk, he/she can be held 40% responsible for his/her own injuries in case of an accident. Even when the passenger was too drunk to have any recollection of boarding, he/she can be held 30-35% responsible. So, the idea is you should always make plans (beforehand) on how to get home safely. “Drunk driving” can instantly ruin many people’s lives. Thanks! I will try to update this post. Stay safe!